Featured: Backing up encrypted data? You're probably doing it wrong. Also this week: Speaking of encryption: a way to keep your cloud data secure, and what happens when the power goes out. My most important book is still on sale! The Ask Leo! Guide To Staying Safe On The Internet - Expanded Edition is 25% off for a limited time. Yes, I consider it my most important book, because it covers what is perhaps the most important, and perpelexing, topic of all: keeping your computer, your data, and yourself safe on the internet. Grab your copy today! Your support helps! 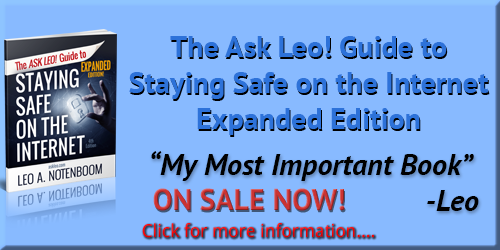 People often ask how they can support Ask Leo!. I've put together a page that lists all the ways I can think of. While your purchases and patronage (and your coffee) help tremendously, not everything involves money! Anything, and everything is deeply appreciated to help keep Ask Leo! going. Support Ask Leo! Encryption is a critical component of keeping data safe and secure and out of the hands of those who shouldn't see it. Unfortunately, I'd wager that most people are backing up their encrypted data improperly. The result is that they're not as protected by that backup as they might think they are. The common approach is to back up the encrypted file. If “improtantdocuments.zip” has a password and is encrypted, then it's “improtantdocuments.zip” you're most likely to back up. It's good you've backed up; don't get me wrong. That's much better than not backing up at all, of course. But you're still at risk from threats your unencrypted data doesn't face. Less common, and less expected, are disk- and file-damage-related problems — the very problems we think of using backups to protect ourselves from. For example, if the disk on which your backup “.zip” file is stored develops a bad sector anywhere within the file, it's possible the entire file will be unrecoverable. While some encryption algorithms are resilient to localized errors to minimize the damage done in cases like this, that's not true for all. Sometimes a tiny error in the wrong place can cause massive data loss if the files are encrypted. Unencrypted files don't suffer from these issues. You'll never forget a password when there isn't one, and any file damage will be restricted to the single (or few) files within which a disk error happens to reside. Depending on the scenario, this doesn't have to be hard. In the case of VeraCrypt and BoxCryptor-like tools, simply back up the contents of their mounted drives. In fact, if you're using whole-disk encryption, your backups will probably be unencrypted by default. By storing formerly encrypted files in their unencrypted form, we mitigate the possibility of encryption-related damage. Even if we choose to encrypt those files using a different technique, we've greatly reduced the risk of permanent damage by distributing the risk. It's significantly less likely that I would lose both my LastPass master password and my private key simultaneously, for example. Back up, yes, but make sure you understand the ramifications and potential additional risks of backing up encrypted data. It may not be an issue for you, and that's great, but think about it now before it turns out that it has become one. I regularly hear concerns about using cloud storage — the biggest being that online files are at higher risk of compromise should your account or the storage be hacked. There are also concerns that your storage provider could be required to hand over your files to law enforcement agencies under certain circumstances. Those are all valid concerns. Cryptomator is a free encryption solution that addresses them. If Shutting Down Windows Cleanly Is So Important, What Happens When the Power Just Goes Out? I am aware that not going through the proper Windows shutdown can possibly have negative effects on a computer. But my question is if a computer loses power (due to a household power outage, not anything wrong with the power supply), are these negative effects strictly software related (meaning a format and reinstall would fix them), or might it cause hardware problems as well? Shutting down Windows properly before turning off the power to your computer is important. Not doing so can result in data loss and corruption as files are left only partially written to disk. But just turning off the switch is unlikely to actually harm your hardware. Surprisingly, a household or other area-wide power outage turns out to be a completely different, riskier issue. Continue Reading: If Shutting Down Windows Cleanly Is So Important, What Happens When the Power Just Goes Out?